Ground was broken Sept. 14 at Fort Belvoir, Va., for the long-awaited National Museum of the United States Army, with a goal to have the high-profile showcase open its doors to the public in three years. The Army is the only service that does not have a national museum. When completed, the $175 million, 186,000-square-foot facility “will celebrate the selfless service and sacrifice of over 30 million men and women who have worn the Army uniform since 1775,” according to the foundation. Brig. 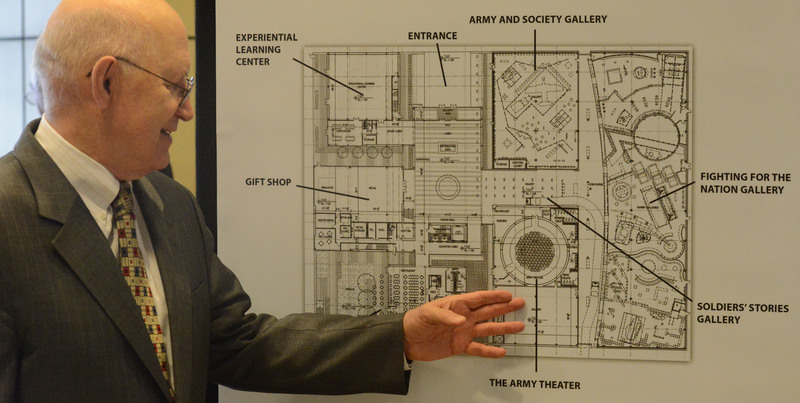 Gen. Creighton W. Abrams Jr. shows off floor plans for the National Museum of the United States Army. AUSA strongly supports the foundation’s efforts to build the museum, which will feature 30,000 documents, artifacts and images, thousands of pieces of artwork dating from the Colonial era to the present, and a large variety of interactive and educational displays and exhibits. About 750,000 visitors are expected each year.